Goodreads:Nick Stone left the Special Air Service in 1988, soon after being involved in the shooting of three IRA terrorists in Gibraltar. Now working for British Intelligence on deniable operations, he discovers the seemingly senseless murders of fellow SAS soldier Kev Brown and his family in Washington, DC. Only Kelly, seven years old, has survived - and immediately the two of them are on the run from unidentified pursuers. Stone doesn't even know which of them is the target. Stone is a master of his trade, resourceful and ruthless. On his own, he would stand a chance of escape. But, needing to protect the girl, he is hamstrung as together they are plunged into a dark world of violence and corruption in which friend cannot be told from foe. As the blistering narrative drives to its blazing and unexpected climax, Stone discovers the shocking truth about governments, terrorism and commerce - and the greed that binds the three together. I got this book because Andy McNab is the favourite author of someone i know so i thought i would have a read and see what i thought considering I've never read a book like this before! I have to say i enjoyed it, it wasn't what I'd normally read but the second one got delivered this morning. It did take me awhile to get used to all the secret service style references and the type of guns and stuff but i got there! 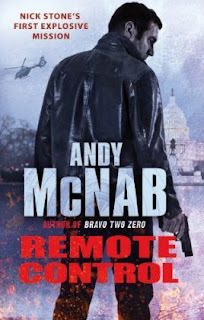 Nick Stone works for the British Intelligence on deniable operations, when he is taken off a job in Washington he decides to make a visit to an old SAS friend before flying home, however when he arrived Kev brown and his family have been brutally murdered! Only Kev's seven year old daughter Kelly survived after hiding. Nick must go on the run with Kelly in toe not knowing who is after them, why or which one of them is the target! Stone must find out the truth and protect Kelly, but with unidentified foes, friends becoming enemies and resources running out can he make it out of this alive? or will he stumble upon some hidden truths that will make him more of a target? When i first got this book i didn't no what to expect or even if I'd like it, it's far of the paranormal and fantasy books i normally read but as it turned out i really enjoyed it! I loved the storyline it was none stop constant action! i really got in to the book and started to feel like i was right there running from hotel room to hotel room feeling the desperation of been hunted down and not knowing who to turn to! I also liked the way the book captured how hard it would be to go on the run with a 7 year old! The plot was also amazing it isn't to the end of the book that everything starts to fall in to place and when then there are massive twists! Normal am a sucker of romance but i didn't miss it in this book because you don't have time to, its just action pack! constantly running, fighting or plotting! I loved Nick he was macho with guns, fighting and all his SAS skills but at the same time i laughed at how this strong and confident man can be so awkward looking after Kelly and i think he melted a bit the more time he spent with her. Kelly was so cute, i felt so sorry for her that she lost her parents and i can only imagine what its like to have to go on the run with you dads friend but it think she played a vital rule in nicks story! I really enjoyed this book, I've actually lent it out for someone else to read and I'll definitely read the next one!